In the summer, on the Slate website, Daniel Hahn bemoaned the lack of translated children’s literature; very little foreign literature makes it across the seas and into our children’s hands. Well, thank goodness Thames and Hudson commissioned the translation of The Book of Bees from the Polish. This is quite the most sumptuous and exquisite non-fiction book to have buzzed in from Europe for a while. 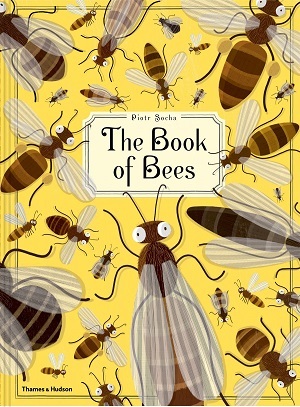 Although concentrating on a small insect, this is an over-sized book, standing at 37 cm height, with a comprehensive encyclopaedic amount of information contained within, discussing not only scientific data about the bee, but also the history of this loveable insect, quirky facts and more. But it’s not dry in any way. 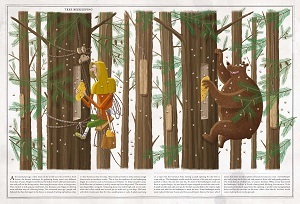 Piotr Socha’s drawings take up the majority of each page – the text runs only seven lines deep at the bottom of the page – and the illustrations are huge, and yet beautifully detailed, funny, extensively researched and splendid to behold. 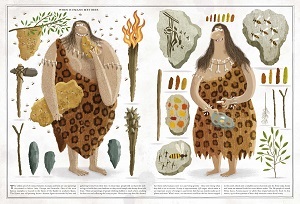 Socha has a way with facial expressions (he is a famous cartoonist) – the section beginning with ‘When Humans Met Bees’ illustrates a caveman and woman, part cartoon, part portrait in a startlingly funny way; eating honeycomb, but also with a palette of cave paints. The text underneath is hugely informative though: evidence of cave paintings showing how the first peoples gathered honey, as well as their motivation, and how they ate bee larvae too, which is a valuable source of protein and fat. From the Ancient Egyptians to the legend of St Ambrose and the swarm of bees, from Napolean and Josephine’s bee-embroidered capes to traditional beekeeping techniques in Ethiopia and Cameroon, Socha covers the subject comprehensively. There’s plenty of nature information too – not only anatomy, but also how bees pollinate, how they make honey, as well as why bees are now in danger. Socha is the son of a beekeeper, and knows his facts. Fascinating facts include locations of beehives on famous buildings, all the food that bees help to grow, biomimicry and the waggle dance. 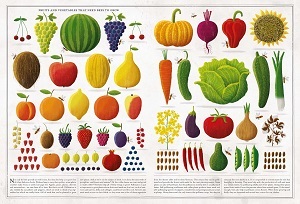 Socha also features The Daily Buzz, a newspaper type double page spread in black and white with hilarious cartoons to highlight other interesting tidbits, such as bees protecting crops from elephants, Virgil and the bees, and honey as medicine. The endpapers are beautiful too – just endless bees, giving the book a luxurious feel. Designed like a coffee table book, yet containing the knowledge of an encyclopaedia, and reading like a fun newspaper, this is stunningly executed – my top non-fiction book of the year. For ages 7+ years. You can buy it here.